I’m all about cookie cups lately. Can’t stop making them. Don’t know why I’d want to anyhow. They’re absolutely fantastic! Quick. Easy. Bite sized. And it’s a cookie + frosting– which I’m always a fan of. Preheat oven to 350ºF. Lightly grease a miniature muffin tin with cooking spray. Using an electric mixer, beat together the butter, brown sugar, and pumpkin puree. Mix in the egg. Add the flour, baking powder, baking soda, and pumpkin pie spice. Mix well. Scoop 1 tbsp into each cup of the miniature muffin tin. Bake for 10 minutes. Immediately upon removing from oven, use the back of a tablespoon to press the top of the cookies in, forming a cup. Let cool completely in the muffin tin before removing. Add one cup of confectioners sugar and the vanilla and mix until smooth. Add one cup of the confectioners sugar and the sour cream and mix until smooth. Add one cup of the confectioners sugar and the lemon juice and mix until smooth. Add one cup of the confectioners sugar and mix until smooth. If mixture is too thick, add 1 tbsp of milk to thin it some. 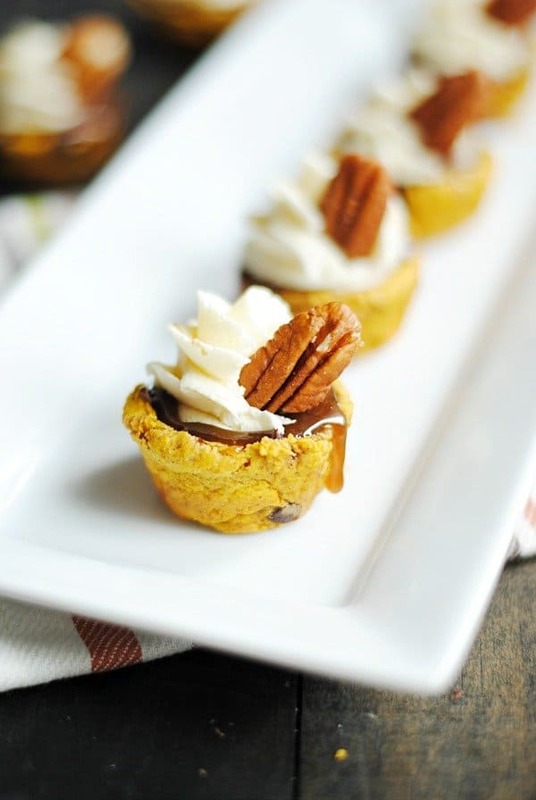 Fill each cup with a teaspoon of caramel sauce. Pipe the cheesecake buttercream on top of the caramel sauce. Man, pumpkin and cheescake. How can you go wrong with that combo? Sounds yummy! Those look fabulous! I love anything pumpkin or cheesecake flavor. My problem will be only eating one so I don’t completely mess up my diet. droooool…. ugh… they look divine! those yummers on definitely going on my to bake list! Holy cow these are all kinds of deliciousness! 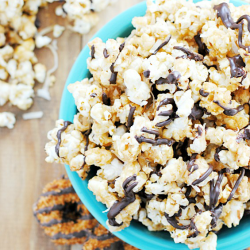 I would love it if you would stop by and share this at my linky party! Oh my! This sounds like a totally yummy recipe. TFS! Cheesecake, pumpkin and caramel in one dessert? Doesn’t seem fair to all the other desserts in the world! I would love to try this recipe. I’m here from Running With Glitter’s link party! These cupcakes look insanely delicious. Pretty sure I’m going to have to try them out. Can’t wait to check out some of your other recipes! Oh my goodness! These look and sound incredible! Thanks so much for linking them up at Muffin Monday! These look amaaaazing! 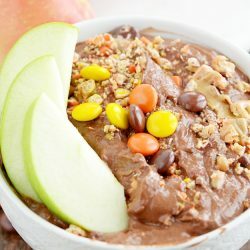 A great fall dessert/snack/mid afternoon pick me up! These look DIVINE! So cute too! Yum! DH and I don’t care for pumpkin pie, so I’m exploring other pumpkin options for this fall! My mom has a cookie cup maker appliance. She never uses it and I keep meaning to get it from her. But it bakes the dough (or once we did tortillas) into cup shapes. They’re great! great idea!! glad i stopped by from the link party! MMMMMMMM. drooling a little here! Yum… my mouth is watering! Quick, easy, and cheesecake…..my 3 favorite words! They look tasty. YUMMERS!! AND SO CUTE, TOO! Oh man, these look SO delicious! Those look amazing! Can’t wait to try them. OMgoodness, I want to lick the monitor! I would love for you to link up to my Everything Halloween party starting this Sunday! Ok, now that I’m starving…lol…those look fantastic! Would you pretty please come link them to my pumpkin party? Wow…what a great recipe. I love it…and cannot wait to try it! I love these!! I think I’ll make them for a fall get-together next weekend – thanks! Yummy! Pumpkin Choc. Chip cookies are my fave and this takes it to a new level! I love all the pumpkin things I’m finding this season! Thanks for sharing at Church Supper! Have a blessed week. See you next Sunday. Just wanted to let you know that over at createlive, we’re just finishing up a pumpkin recipe series called “The 12 Days of Pumpkins.” For the next few days, we’ll be hosting a link-up, featuring any recipes involving pumpkin, and will be choosing a good number of these recipes to have their own page (which can include your blog name and URL!) in a pumpkin cookbook! Just thought you might be interested in the additional press or being included in a cookbook – and this is a really great recipe! Find the link up here! Oh My! These look over the moon good! Thank you for sharing on Thursday’s Treasures. Looking forward to your Delicious addition this week. <3 and Hugs! These look AMAZING! Thanks so much for linking up to Tuesday Talent Show! I am featuring your wonderful recipe at the party! I would love to have you stop by and link up again tomorrow with more great projects! Holy cow. I need one of these today! Thanks for sharing the recipe!! These look delicious. Caramel and cheesecake. MMM. Can’t wait to make them. 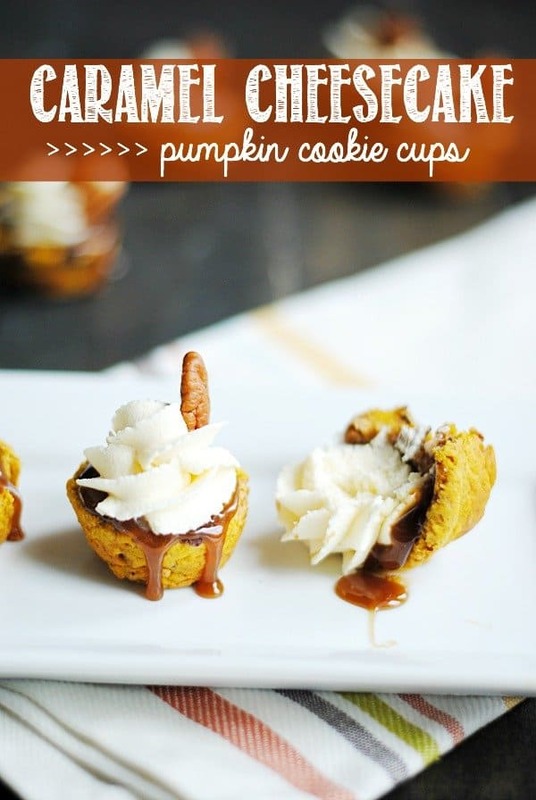 Hey I’ll be featuring these tomorrow on my blog http://www.trilogyedibles.com for great pumpkin recipes from around the web! I made these today and they turned out really great! Thank You!